The perfect combination of reasonable prices and high-quality designs and materials mixes together with Leisure Select Patio Furniture. Whether you're looking for a few pieces to fill a corner of your deck overlooking the lake, or looking to outfit an outdoor room, porch or three-season room, we have you covered. They offer everything you could want and need in collections such as gorgeous sectional sets, dining sets with stackable dining chairs and glass-topped tables, three-piece chaise lounge sets and deep seating sets with beautiful coffee tables. Combine an extravagant dining set with a bar height seating or bistro set to create seating that will leave no guest standing! And with every material you can think of, from classic wicker and wrought iron to comfortable sling and durable cast. 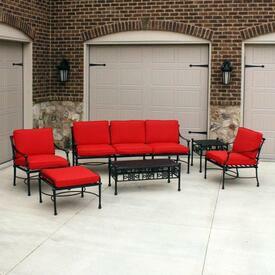 So shop around... we promise you will find the perfect combination for your porch, deck, patio or three-season room.